In Windows go to Start > Computer (or My Computer). Open the C: drive (local hard drive). Open the folder Program Files > Procare > Client. 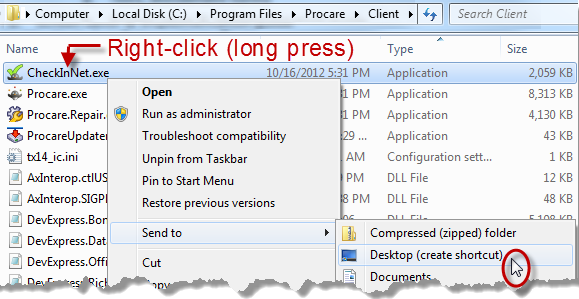 Inside the Client folder right-click one of the files below and choose Send To > Desktop (create shortcut). For Procare, right-click the file Procare (may say Procare.exe). On a touch screen use a long press. For Check-In, right-click the file CheckInNet (may say CheckInNet.exe). On a touch screen use a long press.